€222 million – last year, Paris St. Germain paid FC Barcelona this unimaginable transfer fee to secure the services of a Brazilian forward. Admittedly, this was the most expensive transaction in the history of football, so it is an exception. However, this sort of news may be one reason why professional footballers and other elite athletes do not have the best image. At any rate, Germans seem to not trust this job too much. The opposite can be said for other industries: Above all firefighters enjoy a large amount of trust, and they have stood at the top of the rankings for years. This doesn’t just apply to Germany either – it applies to the rest of the world too. Whether north, south, east or west: All over the world, people have particular confidence in firefighters and assign them the most trust. In 11 out of 20 countries surveyed, firefighters not only rank above all other jobs, but they are also mainly assigned particularly high levels of trust of 90% and over. Only in South Korea is this value somewhat smaller, at 88%. 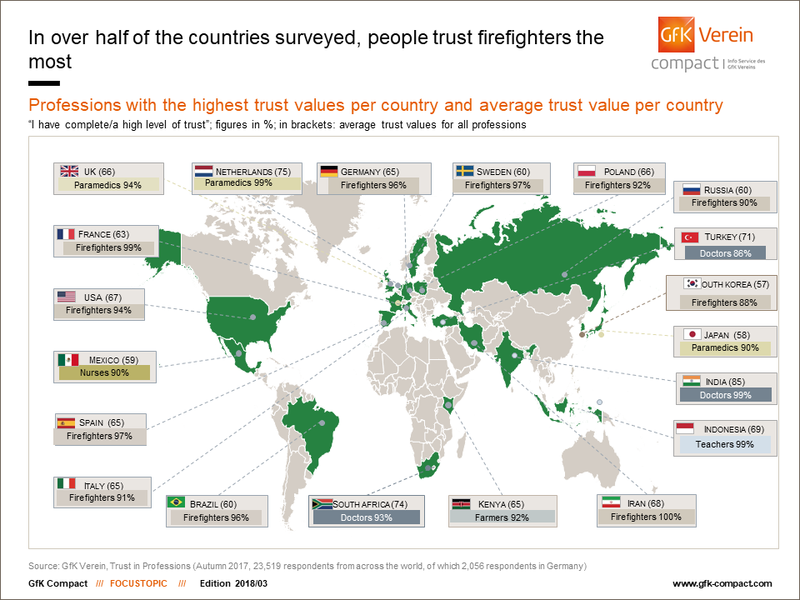 In Iran, 100% of respondents actually view firefighters as particularly trustworthy. These are the results of the “Trust in Professions 2017” study carried out by GfK Verein last fall, in which more than 23,000 consumers were surveyed. People from 20 countries around the world were interviewed with the aim of discovering the level of trust that they have in 32 predetermined occupations. In addition to firefighters, other caring professions are perceived favorably by citizens once again: In India, South Africa and Turkey, physicians are assigned the greatest trust, whereas this honor goes to paramedics in the Netherlands, the UK and Japan, while Mexican respondents above all trust nurses. As with previous years, teachers and farmers feature on the world map of trust leaders: Teachers enjoy a particularly good reputation in Indonesia, while in Kenya, where agriculture forms the most important sector of the economy, farmers are out in front with nearly all respondents (9 in 10) affirming their trust in them. Although there is something approaching global unity when it comes to the reputation of firefighters, average trust levels vary from country to country across all job groups. As with the previous survey, overall trust values are highest in India. Average trust levels here have climbed to 85% across all industries surveyed. Also in the top three, although some distance behind, are the Netherlands (75%) and South Africa (74%), closely followed by Turkey (71%), Indonesia (69%) and Iran (68%). The USA and some European countries only begin to appear in the middle of the rankings: Average trust of 67% is granted in the USA, putting it in seventh place, while this figure is 66% for the UK and Poland and 65% for Spain, Italy and Germany (on a par with Kenya). France comes in at 63%, with 60% for Russia, Sweden and Brazil. Mexico, Japan and South Korea bring up the rear in terms of average trust. These countries all have values below the 60% mark. A look at the European rankings (consisting of ten countries including Russia and Turkey, weighted by population) clearly reveals one thing immediately: Caring professions are ranked very highly in Europe too. Firefighters are still at the top here. A total of 93% of respondents have trust in this profession, but with a figure of almost 88%, nurses and paramedics are also seen as very trustworthy. A large majority of people also rely on the advice of pharmacists, at 85%, while 84% trust pilots and teachers. Physicians, farmers, public transport drivers, and soldiers also score very well – between 83% and 80% – closely followed by engineers and technicians (79%), tradespeople (78%), and architects (75%). Nearly three quarters of Europeans trust the police. Computer and software specialists, taxi drivers, retailers, attorneys and civil servants feature in the middle of the rankings, with values in excess of the 60% mark. Another legal group just misses out on this: Average trust in judges among European respondents is 59%. Professional athletes, as mentioned in the introduction, are assigned a trust level of 57% – the same as actors. Just over one in every two respondents (53%) view priests and other spiritual professions as trustworthy – this is the same level as market researchers and pollsters. TV moderators manage to just stay on the right side of the 50% mark (52%). A total of seven professions are currently not able to win the trust of the majority of Europeans. For instance, entrepreneurs and mayors are seen as trustworthy by 47% and 46% of respondents respectively. With an average trust level of 44%, bankers and bank clerks are placed just above journalists (41%) and insurance brokers (37%). Advertising executives came in penultimate place, with over a third of European consumers affirming their trust in this profession (35%). As with previous years, politicians came in last place: At 19%, this profession is not even trusted by a fifth of Europeans. Presumably this is due to the fact that politicians are always in the media spotlight as a result of their social responsibility with any errors of judgement quickly highlighted. The trust level in Germany is often on a par with the European level, or even higher. Caring professions also take the top spots in Germany: Firefighters are out in front – and are even 3 percentage points above the European average – alongside paramedics, who rank in third across Europe. Nurses and physicians are two additional social jobs that do better in terms of trust in Germany than they do in the other nine countries. The difference is particularly striking in three professions: Police officers are truly seen as much-lauded friends and helpers in the eyes of 84% of Germans, enjoying more trust than the European average at first glance (72%). However, this European average is strongly impacted by Russia’s population, which negatively affects the books. Only just over one in every two Russian respondents trust the police, which means the average is much lower than otherwise would have been the case. Mayors, who are not even trusted by one in every two people in Europe, benefit from a value of 60% in Germany, which corresponds to a gap of 14 percentage points above its European neighbors. Judges go one better: Almost three quarters of Germans trust in their judgment and expertise, placing them 15 percentage points above the European average. Other professions fare worse in comparison: The level of trust for soldiers is in the mid-range, at 69%, but this is 11 percentage points under the European value. Perhaps reports on the partly crumbling equipment of the German army have colored perception of the entire force. Or maybe it is the news on bizarre initiation ceremonies or right-wing thinking in some barracks. Either way, it might not hurt for them to focus on enhancing their image. This also applies to retailers and salespeople as well as actors, who all lag 11 points behind the European average. While retail is trusted by over one in every two people, actors do not reach the 50% mark in Germany, remaining just below it at 46%. Across Europe, in contrast, 57% of respondents trust actors completely. 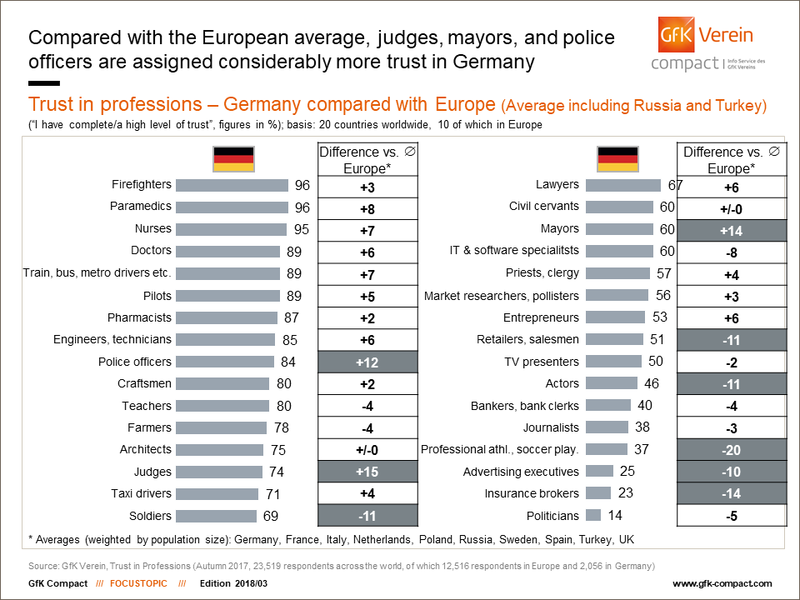 This is not the only difference at the lower end of the scale: Both in Germany and in Europe, seven professions are only trusted by a minority, but the configuration and ordering of the last places vary. In addition to actors, athletes also do not have a majority behind them in Germany. Only just over one in three respondents sees them as trustworthy, which is 20 percentage points below the average. Moreover, advertising executives and insurance brokers score clearly lower than the European average with a two-digit deficit in each case. When the current results are compared with 2016’s figures, two big changes appear for Germany. Attorneys have lost five percentage points in the trust rankings since the last survey, which may be a reaction to the high profile NSU trial, when motions from the defense delayed the pleas from the federal prosecutor and the joint plaintiff by several weeks. Professional athletes also lost popularity to the same extent, which could not least be as a result of the transfer fee mentioned in the introduction to this article, which is hard to comprehend even for die-hard fans. How to build up trust? If you have any queries, please contact Ronald Frank (Ronald.frank@gfk-verein.org) or Claudia Gaspar (claudia.gaspar@gfk-verein.org).